Everyone handles stress in their own way. Something I learned during the hurricane is that being in the kitchen is a major stress reliever for me. I never usually panic about a storm but Sandy felt different. I think part of me is still mildly traumatized from the derecho in June that came out of nowhere and made life hell for a week. We were so unprepared for that. After listening to our Governor hold a press conference on Monday stating that “PEOPLE WILL DIE IN THIS STORM” and to weather people saying that this was THE PERFECT STORM… I just kind of freaked out. I’ve never been a weather alarmist. I usually make jokes about people running to the grocery store for toilet paper before a big weather event but yesterday I was totally one of those people. I went to the store and got a ton of canned goods, filled up at the gas station, scrubbed down the entire kitchen, pulled out all of our flashlights and lanterns… just in case of what? I don’t know but this time I was determined to be prepared for anything. I spent all weekend and yesterday preparing and waiting and my anxiety was through the roof. The rest of the day I was either glued to the television or baking. I made granola bars, hummus, spicy pumpkin seeds and apple muffins. Each time I felt like I was tempting fate as our powered flickered and threatened to vanish. But being in the kitchen was so calming to me, especially as I watched my beloved Ocean City go under water and listened to winds outside that sounded like a freight train about to run over our little townhouse. I frantically tweeted with others along the East Coast. I stared at the giant tree in our backyard, willing it to stay upright (it did). 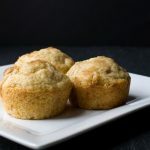 I wasn’t planning to get any blog recipes out of the experience but the muffins were some of the best I’ve ever made. They were delicate, fluffy and rich. I had leftover brown butter which made them incredibly tasty. They were comfort food. I needed comfort. We never lost our power or dealt with any kind of damage. I feel incredibly lucky we were spared. My thoughts are with everyone who was impacted by Hurricane Sandy. In a large bowl, whisk together the flour, baking powder, sugar and cinnamon. Stir in the chopped apple. In a separate bowl, whisk together the egg, vanilla, milk and brown butter. Stir the wet ingredients into the dry until just combined. Don't overwork the batter, some lumps are fine. 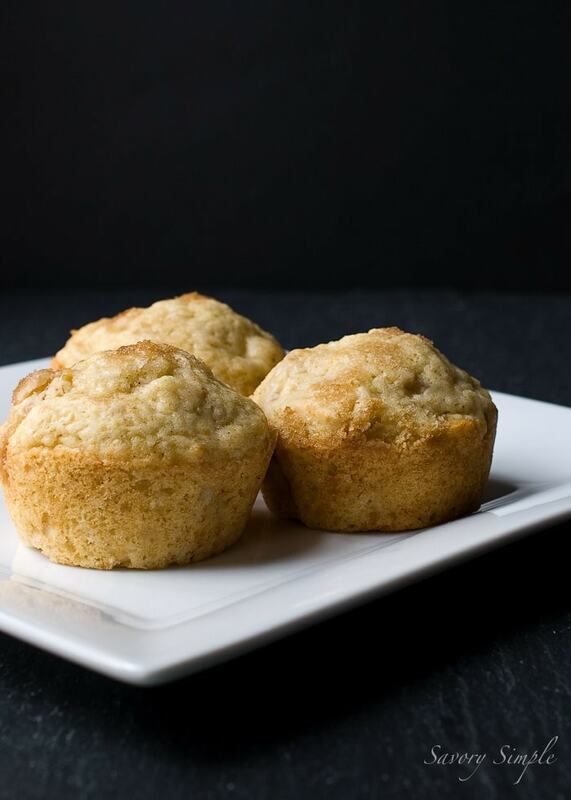 Scoop the batter into the prepared pan and sprinkle a bit of brown sugar on top of each muffin. I have an abundance of apples right now. I’ll be making these tomorrow. Making these right now. The scent of browned butter is heavenly. added some oats and flaxseed meal, plus a dash of turmeric and cayenne. Can never leave well enough alone.